You can download for free the Schematic .PSD - Lighting Diagrams here. Step 1 - The Key Light. As the Key light, we used a beauty dish from the left of the model, very close to her with a soft diffusing tissue on the beauty dish. It's always like that - first you need to understand and to see the placement of your key light and what this will looks like. As you can see here, we are using a gray charcoal background. I will be honest, I love that color so much that most of the portraits I shoot, I do so with this color background. In fact, its my addiction (well one of them :) ). 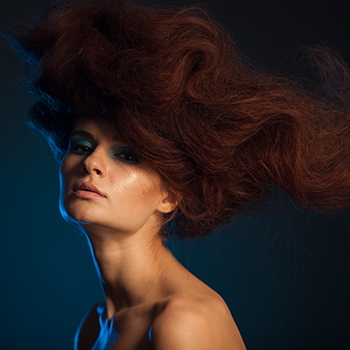 By directing a light with 120° Wide-Angle Reflector with a blue filter on the background, we can create a sort of the 'night sky' effect behind the model. On the image you will notice that the dark part is at the bottom rather than the top, but before the final shot we moved it above to achieve the desired effect. Step 3 - Blue Contour Light. To the right of the model and roughly one step behind, we have a long stripbox with a blue filter. Before setup, I would recommend to turn off all other lighting sources for better comprehension and to control this specific light with more accuracy. Then when you're ready, simply turn it back on. Step 4 - White Reflector. 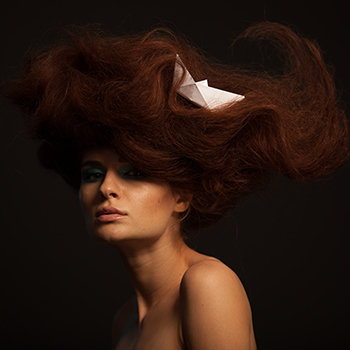 As you can see in the step 4, the abundance of hair drops a significant shadow on the eyes of our model. We could change the position of the key light but that will alter everything that we have set up so far; therefore in this case, we cannot move it. A white reflector will usually help you in situations when you need to “rescue” an area from being too dark hence, we will need to find the right position for the modifier. Keep in mind that models will always change position so it's always better to ask someone to help here; just make sure that it is someone who will understand how to execute exactly what is needed. Step 5 - Long Exposure. Now we need to setup one more light – one that we will use to "draw" with during our long exposure time. For this we employed the use of the modeling light; however, you can accomplish the same effect with any other continuous light in your studio. 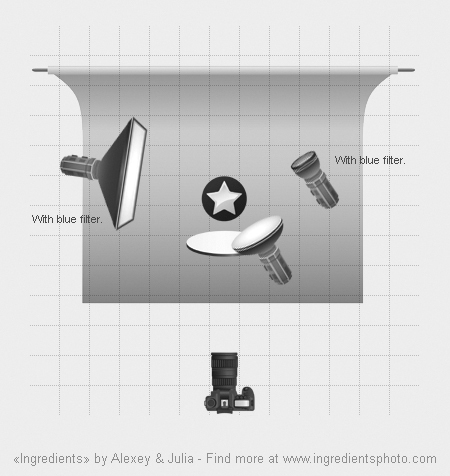 Our source was the modeling light from the stripbox, the one with the blue filter. Do you remember? But the final result was achieved with the key light modeling light and a very low power blue stripbox mix. And now when you're happy with the lighting setup, let the fun begin!!!! Setup a long exposure on your camera, something like 1 second, be sure that your studio is 100% dark and there is no other lighting, only the light that we're using on the model and start shooting and shaking your camera in all possible creative ways that you can imagine during the exposure time; from the left to the right, shake it, wave it! All depend of what you're looking for and what you need at the moment. We were shooting for commercial purposes on this day, so we were looking for a very good quality and focus. However, I really like many other versions from that day! I hope you liked that little story of one of our images and that it will push you to go and shoot something new and cool! Experimentation is all that we need. Good luck! P.S: If you like that article, please don't forget to share it with your friends! Thank you.